After I wrote a review of the Fuzzi Bunz One Size cloth diaper, a few people commented that they still preferred organic. I get it, folks. If you’re going to use cloth, you might as well go super-eco and go for organic cloths. Especially when it comes to your baby’s precious skin. So I did my research, and found a very interesting organic CD: The Gro Baby. I am so excited about this soft, eco-friendly diaper! I have high standards when it comes to CDs. So let’s see how this one measured up to my bum snobbery, shall we? What are these expectations? The diaper must stay put, especially because my sneaky lil’ guy has been known to streak. (Naked boy! Naked boy!) Any diaper that “grows with the baby” must actually fit that baby pretty well at most stages. And aesthetics help, considering my 15-month-old Baby E loves to run the yard in a diaper only. I lov diapers that look good, no matter how silly that may sound. Design: With snaps and elastic, the Gro Baby fits even my thin boy Baby E quite snuggly, thank you very much. The shell has a quick-dry mesh and the soaker pad snaps into place. The best part? You simply replace the insert and use the shell as a diaper cover! Very easy; very green! My Gro Baby also has velcro-like enclosures. But they’re not “extra” tabs, as they are on other diapers. Nope, these babies are built right in. And they are so strong it’s hard to imagine them ever losing cling-ability. That’s so important, because my little streaker would love to let it all hang out! Performance: Simply put, these are great. No leaks, even overnight. I did use their booster soaker for Baby E’s nighttime wear, but I add an extra insert with many of our CDs for overnights. Only the difference is, the booster and soaker together are thinner than most single inserts, so no bulky, bulgy diaper! Plus, because they snap in, there’s no shifting, no matter how active your wiggly worm is. For daytime wear: when my baby boy wet the diaper during the day, I simply replaced the soaker. It was easy! And easy, as every parent knows, is quite important. Aesthetics: I love the colors that the Gro Baby comes in. Look at that blackberry! What…no candy apple red? Cloth diapered butts win hands down to any disposable-donned bottom. But these colors are fantastic. Not a pastel pink or blue in sight! Softness: Soft? Try this. Touch the standard One Size diaper, the part that touches baby’s skin. Not bad, no. Now replace that feeling with the actual feeling of cloth. Natural fibers are great if your baby tends to get redness or diaper rash. And even if she doesn’t, wouldn’t you rather have super-soft organic cotton against that sweet skin? Affordability: The Gro Baby is one of the most modestly priced organic diapers out there, at a mere $24.95. Plus, you only have to buy a few extra soaker pads, and the shell can last through multiple changes–until it’s wet! How cost-effective: less washing, less changing. Ease of Use: Like I said: it’s easy. It only takes two steps, really, once you have the front snaps set to fit your critter. You unsnap the soaker pad and snap in a new one! No fishing for an insert in a pocket diaper. No pins. Easy to put on, take off, and to launder. It’s a simple, well-designed cloth diaper. “Green-ness”. Let’s see…. You only wash the shell when you need to = less water waste. There are no dioxins = good for baby and the environment. All (or almost all) cloth diapers = less landfill waste. 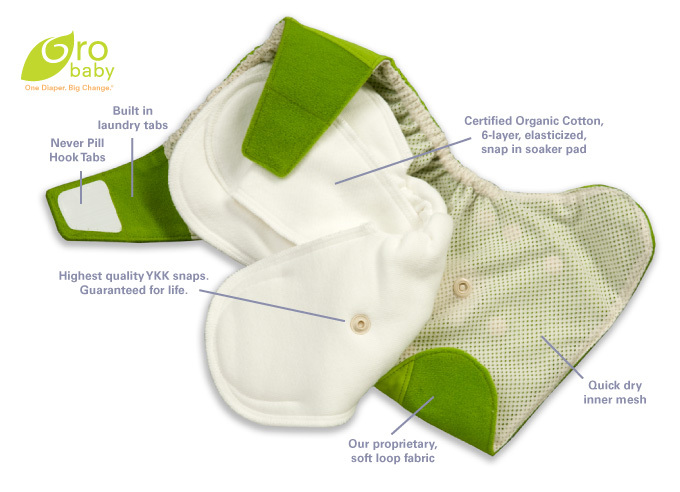 Organic cloth diapers = pesticide free, which is good for baby, the workers who grow the cotton, and the environment! You can only get greener if you opt out of diapering, folks! All those fantastic benefits in a great priced organic! You and baby both win! Now, it’s coupon time. This weekend, Gro Baby is offering a coupon at their site! Simply type the code ECOCHILD09 and save 10% on all in stock products. Hurry, though! This coupon is good from June 19-22. And special thanks to mom-trepreneur Kim Ormsby for setting up this deal for us! Images: That’s my Baby E and my raised bed garden. Wowee! The second image is from the Gro Baby site. Dig this? Follow me on Twitter. I tried the grobaby and absolutely love them. When I tried your coupon code, they only gave me $10 off instead of 10% for an order of $390. Have you heard of any other issues? I did not hear of any other problems. I hope they sorted it out for you? I love their diapers and hope that buying in bulk worked out for you! It always has for my family!